Over the past decade there's been a concerted move into making laptops thinner and lighter whilst not skimping on everyday performance. Ultrabooks and MacBooks have led the way, shoehorning potent CPUs inside chassis weighing not much more than a kilo and measuring just 15mm thick. Such portability and sleekness inevitably brings certain compromises along the way, with a lack of ports and connectors of primary concern to those wishing to use their laptops as effective desktop replacements. Here is where one connectivity technology offers bags of potential for expanding the usefulness of portable machines: Thunderbolt 3. The latest standard provisions 40Gbps of bandwidth, per port, which can be used over USB-C to provide power, multi-display bandwidth, device charging capability, and connectivity throughput for Ethernet and USB. Phew. Best of all, this jamboree is provided by a single cable from laptop to end device. It is this combination of connectivity flexibility and lack of requisite ports on premium, modern laptops that gives rise to an ever-growing number of docks. Looking to beat them all, enter the Elgato Thunderbolt 3 Pro, priced at a considerable £330. The Pro measures 220mm (l) x 80mm (w) x 24mm (h) and is an attractive bit of kit thanks to its curved chassis contrasting well with the darker front and back sections. The overall look and feel is reminiscent of recent premium HP and Alienware laptops. The neutral colour scheme fits in well with an array of notebooks, from Apple's MacBook through to the Microsoft Surface line. Four rubberised feet provide solid grip with most surfaces though you need to hold the dock with other hand when engaging and disengaging ports. It also needs to be laid flat, taking up desk real estate, because there is no accompanying stand for vertical positioning. It is nice and portable on its own, slipping easily into a laptop bag, but the large accompanying LiteOn power brick, offering up 170W (20V, 8.5A) of juice, used on similar docks and high-performance laptops, is anything but. There's little Elgato can do about this, however, though I'd prefer it to match the dock's colour at the very least. On a better front, the supplied Thunderbolt 3 cable measures a handy 66cm long. There's good reason why so much power is required; the Pro dock offers up to 85W of charging power through the single USB-C Thunderbolt 3 cable. That's enough to drive a multitude of Ultrabooks without the need for a separate power cable, reducing cable clutter and port contention, yet is just shy of keeping an 87W Apple MacBook Pro fully charged when under the pump. Do understand this is a corner-case scenario unlikely to be experienced by most users. The dock's overarching purpose is to offer as many useful ports and connectors as possible. The Elgato Pro does reasonably well here. The front is home to two USB 3.1 Gen 1, a headphone jack, and an SD and micro-SD card reader compatible with the UHS-II cards. The rear, meanwhile, hosts Gigabit Ethernet, headphone out, dual USB 3.1 Gen 2 over Type-C, dual Thunderbolt Type-C, a full-size DisplayPort, and a power inlet. Elgato recommends the right-hand Thunderbolt 3 be attached to the host computer whilst the left-hand port offers 15W of charging capability ostensibly for mobile devices. Compared to the non-Pro dock, this dearer model features that SD card reader and an extra USB port. A few observations. I'd prefer to have a USB-C port on the front for connecting a new range of high-performance storage that may be used frequently; getting around the back is needlessly tedious. There are no activity/status LEDs whatsoever, unlike some of the competition, so one doesn't know when the dock is active. To this end, I'd also prefer a dedicated on/off button. It's handy that all USB ports offer standalone charging in instances where the dock is not connected to a computer, which is a feature some rivals do without. 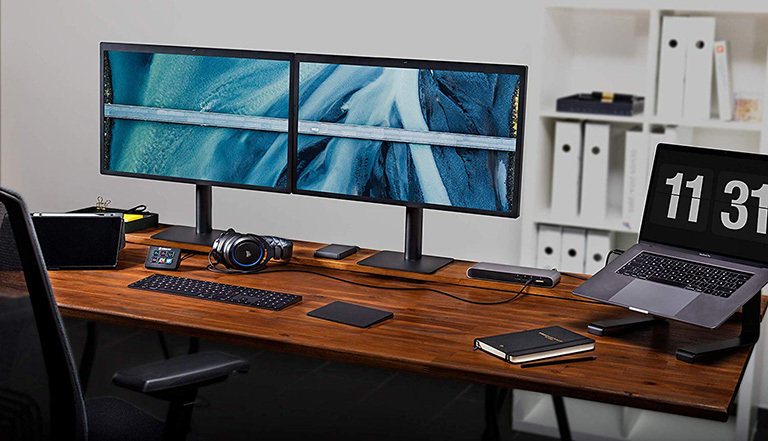 The Pro drives two monitor at 4K60 via the dedicated DisplayPort connector and over the second Thunderbolt 3, or a single 5K screen. Appreciating the premium nature, it makes sense for Elgato to either bundle a USB-C-to-DP adapter and/or HDMI cable. Neither are present by default. Perhaps going a step too far on my wish list, wouldn't it be cool if the dock had built-in wireless charging on the top? It's is the perfect size for it, and given the ample 170W input power, integrating some form of support would free up a USB port. I tested the Elgato Thunderbolt 3 Pro's bandwidth in a number of ways. 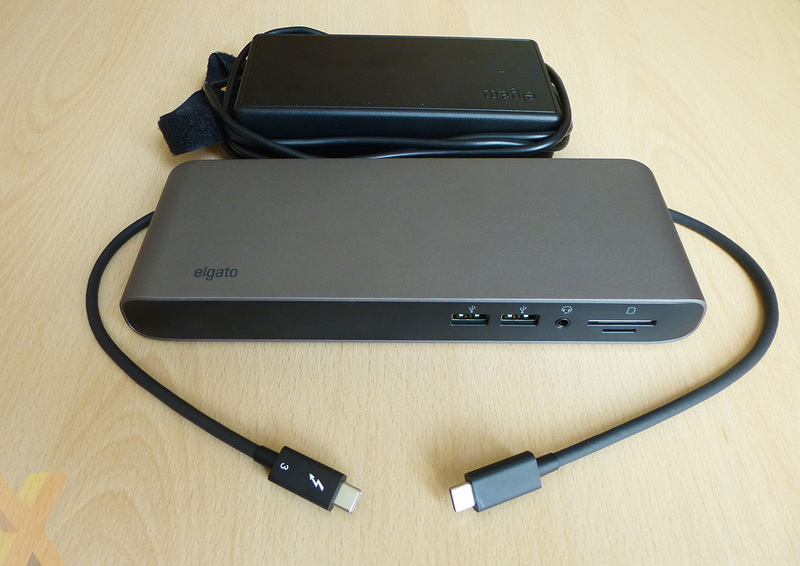 USB evaluation was done by using two external 2.5in, USB 3.1 Gen2 caddies connected via either Type-A to the Elgato's USB 3.1G1 port and to the second Thunderbolt 3 port via Type-C, though using the latter naturally precludes a dual-display setup. In both instances a 500GB SK hynix SL301 Sata drive was installed, with peak sequential read and write speeds of 540/470MB/s, respectively. The same enclosure was also hooked-up to a USB 3.1G2 Type-A port on the test PC, to see how direct-attached storage differed from going via the dock. Connecting the caddy directly to the PC via USB 3.1 G2 offered sequential read and write speeds of 512MB/s and 443MB/s, respectively, which is pretty close to the drive's maximum. The same test done with the caddy attached to the front-facing USB 3.1G1 Type-A port offered up 397MB/s read and 368MB/s write. That's a fairly significant reduction for going through a hub, not helped by using the older USB standard. Last but not least, going over Type-C Thunderbolt 3 increased transfer speeds to 503MB/s and 421MB/s, making it much, much closer to a direct connection. This is to be expected because the rear Type-C USB offer a potential 10Gbps throughput, double that of the front. Networking, meanwhile, was tested with Passmark Network Benchmark. The dock produced better results here, averaging 928Mbps over the Gigabit connection between two PCs. The test shows there's clearly enough bandwidth over the Thunderbolt 3 connection to service high-speed peripherals and networking at the same time. Overall performance, then, is decent enough, though I'd prefer the front-mounted USB to also be of the second-gen variety. Expanding the versatility of modern sleek laptops, which are often shorn of necessary ports and I/O for content creators, requires an additional hub. The very best ferry data over the latest Thunderbolt 3 interface. Makes sense, too, with its potential 40Gb/s and multi-protocol support to boot. Elgato Thunderbolt 3 Pro dock adds in a number of useful benefits over its predecessor and is presented in an attractive package. It does everything it says on the tin, including charging, dual-4K display capability, and carries enough USB to sate most user's needs, but I'd encourage the company to provide activity LEDs and a dedicated on/off button. At the £330 price point, having a couple of useful adapters wouldn't go amiss, either. All that said, if you're running a two-grand laptop and want to turn it into a high-performance desktop quickly and easily, the Elgato Thunderbolt 3 Pro is solid plug-and-play solution that just works. The Elgato Thunderbolt 3 Pro Dock is available to purchase from Scan Computers. Windows 10 updated to enable USB 'Quick Removal' default Asus UK launches the RoG Strix Scope gaming keyboard QOTW: What wattage is your power supply? HEXUS Week In Review: ROG Strix XG49VQ, Aorus 15 and more QOTW: How fast is the storage in your PC? I really want to see Thunderbolt 3 devices using the Titan Ridge JHL7440 controller with dual USB-C ports. This allows a device to auto switch between functioning as a Thunderbolt device or USB device. That's … expensive. Use the Lenovo one myself (1st gen) which are barely £200 and have a better selection of display outs. Biggest issue (for Macs) is Apple's continuing refusal to support MST. That's why this doc has only two display outs, and you have to tie up the 2nd thunderbolt if you want to run more than one screen. Useless. On a PC you can plug in and run two screen plus the thunderbolt.